Greetings chilli chums, and welcome to more rambling thoughts from a fevered imgination. I’ve been having an internal tussle with precisely what to use as the title for this week’s post. ‘Gazebo Envy’ was a real contender, which came about because somehow, with no knowledge of what I was doing at the time, I appear to have bought a gazebo that other traders lust after. Now I know that a bit of snobbiness came to the fore when I bought it (‘I’m not having the bottom of the range’) but little did I know that market organisers would be pointing it out to traders whose own canopy has just sailed over the rooftops and saying ‘that’s what you should have bought’. Maybe it’s the colour (which was a deliberate action on my part to make it stand out from the crowd), maybe it’s the perceived robustness (it’s pretty damned solid), or maybe it’s the fact that even a dullard such as myself can put up the thing single-handed. Whatever the reason, it appears to be gazebo royalty. All hail King Gazebo! Now there is a reason for this of course. Last week friend of the farm Dawn, who is organising the Oxordshire Chilli Festival, came to make some sauces in Jamie’s kitchen. Now this was achieved with the minimum of fuss, only sporadic swearing and the usual amount of ritual abuse of anyone within hailing frequencies. It was only when Dawn mentioned that she wanted a chilli vodka for use at the Festival launch party that The Abominable Dr Sythes’ eyes lit up…and to cut a long story short, before we knew it there was a bottle of vodka absolutely rammed with scorpions, habaneros, chipotles and ghosts. Normal people would, of course, have added just a chilli or two – maybe as many as ‘a few’ to the vodka. Not our Jamie, heavens no, nothing so half-hearted. Now far be it from me to suggest that Jamie is on a mission to inflict real pain on the inhabitants of our sceptered isle, but I tasted the results – just the tiniest amount, barely enough to call it a tasting really – and damn near passed out on the spot. I’m glad I didn’t try a proper shot of it or I strongly suspect my insides would have become my outsides, and at some considerable speed. Quite, quite extraordinary, and not a little combustible. Probably the hottest thing I have ever tasted. 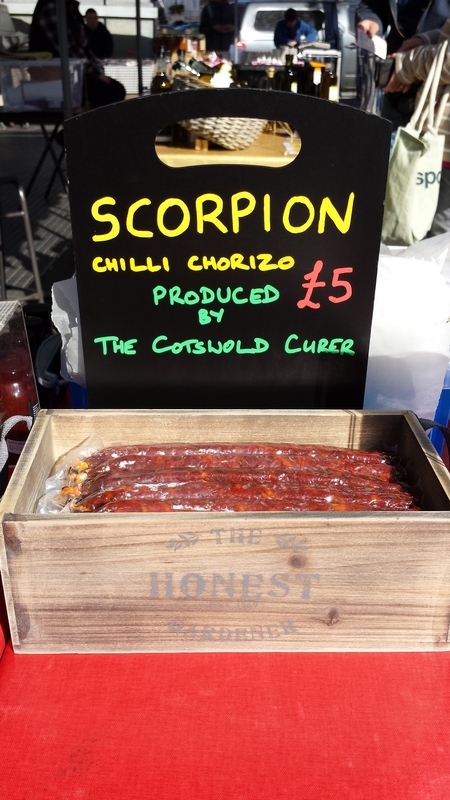 Saturday was my home fixture in Devizes, it was a really lovely spring day and our newest product, a scorpion chilli chorizo made for us by Pete at The Cotswold Curer, was extremely well received. Damned tasty it is, it won’t be around for long and I hope we get to order some more! The biggest problem is not eating all the samples. I’ve had to display unaccustomed levels of restraint all weekend, and as someone who is generally no stranger to the pie shop I have surprised even myself. S unday saw a first for me at Frome’s Independent Market. Now I’m not sure what I expected having never been before, but it a lot bigger than I’d anticipated and consequently was very, very busy. Having mastered the slope I did a brisk trade all day, and am looking forward to returning next month. My final outing of the weekend was to a very pleasant event at Wanborough, in the form of a May Day Fayre. Another lovely day brought the crowds out, I was mobbed all day by the locals who obviously love their chilli stuff, and before I knew it I was packing up and heading off home for a lie down and an adult beverage. 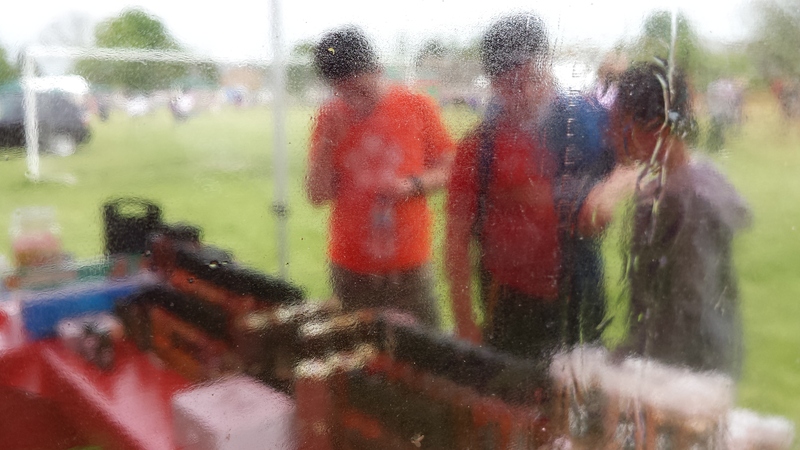 A really nice village event, well run by the locals (although Luisa’s Cupcakes did have a pitch-related crisis early doors, for which I was glad to help ameliorate – I look forward to my payment in cupcake form) and it’ll be great to go back. A day of planting at the farm awaits tomorrow (I can already hear my aging bones complaining), and what purports to be a quiet(ish) weekend beckons. I can be found in Sherston on Saturday and Chippenham on Sunday – hope to see you there. We’re also in Oxford, Kenilworth, Bath, Devon and Swindon over the next few days, so hunt us down. 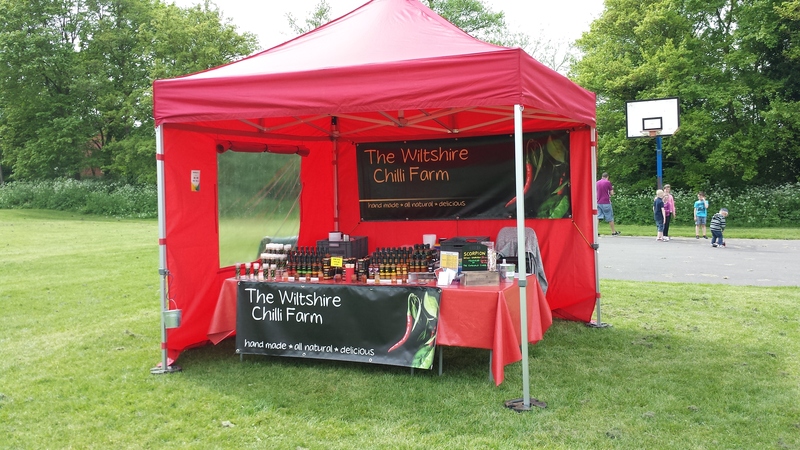 Finally, good luck to Claire from Hive Originals, who will be trading at the Badminton Horse Trials this weekend with the Pink Chilli Hobbit as her able assistant. I know this is a massive event for Claire so I hope it goes really well. Fingers crossed! Well I think my Sunday roast is nearly ready (I know, but I work a wonky work week remember) so I’ll sign off. Have a great week and speak to you soon. This entry was posted in Chilli, General and tagged Bristol, Devizes, Frome, scorpion, Tidworth, WCF. Bookmark the permalink.